"Radio Hall of Fame: Breakfast in Hollywood"
They called her “the Brazilian Bombshell”. She seemed to drift north like a tropical storm and left the Norteamericanos on their collective ears. Credited for raising North American awareness of our Latin American neighbors, she faced derision at home for fusing the various Central and Southern American cultures into a simplistic mix that would appeal to a narrow North American lens. Maria do Carmo Miranda da Cunha was born in Portugal in 1909, and her father moved the family to Rio de Janeiro, Brazil, while she was still an infant, and opened a barbershop. Her father tagged her as Carmen to salute his admiration for the opera. This helped to encourage the little girl's love of singing and dancing, although the thought of his daughter in show business was an unhappy one for the barber of Rio. When Carmen's older sister needed to return to Portugal to recover from tuberculosis, Carmen went to work in a millinery shop to help pay the medical bills. She soon created her own profitable line of hats. She was discovered in 1929 by composer Josue' de Barros who helped her to record her first album with Brunswick. 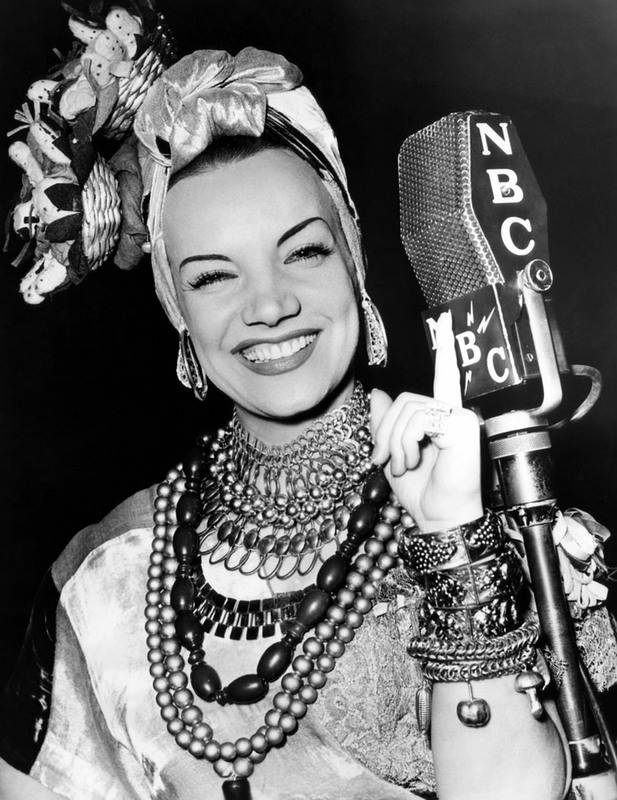 Carmen Miranda became Brazil's first pop star and her rise was linked with the growing popularity of distinctly Brazilian samba music. Broadway impresario Lee Shubert saw the Brazilian sensation during a visit to Rio in 1939, and immediately offered her a contract to sing in his summer musical, The Streets of Paris. Miss Miranda refused unless her band, “Bando da Lua”, was included in the deal. Shubert refused, saying that there were plenty of good musicians in New York, but Carmen insisted, knowing that North American musicians could never get samba right. Finally, Brazilian dictator Getulio Vargas stepped in, believing that Carmen could serve as an ambassadress for Brazil, and the government paid for the band's passage to New York. Broadway revues were having difficulty competing with the 1939 world's fair, and Carmen was credited as “the girl who saved Broadway from the World's Fair”. Ironically, audiences had no clue as to what she was singing about except for the “gay rolling of Carmen Miranda's insinuating eyes”. It was only a matter of time before Hollywood came to call. She had an unbreakable contract with a New York club while her first film, Down Argentine Way, was being filmed. Her numbers were filmed in a New York studio and edited into the Hollywood film. Her success in the USA hurt her popularity in Brazil, where she was criticized for being too Americanized. In fact, audiences throughout Central and South America were offended that Carmen was cast less as a Brazilian and more as a “Latin American bimbo”. Her popularity during the War years is undeniable. She became the first Latina to have her hand and foot prints preserved in the sidewalk outside Grauman's Chinese Theater and the first South American to have a Star on the Hollywood Walk of Fame. However, changing post War tastes brought an end to the big budget musicals that made Carmen Miranda famous. She continued to have limited success in night clubs, but clearly her star was fading. Her final performance was filming the TV variety program The Jimmy Durante Show on August 4, 1955. Durante saw that Carmen was “outa breath” and offered to take her lines. She refused and they were finished working around 11 PM. 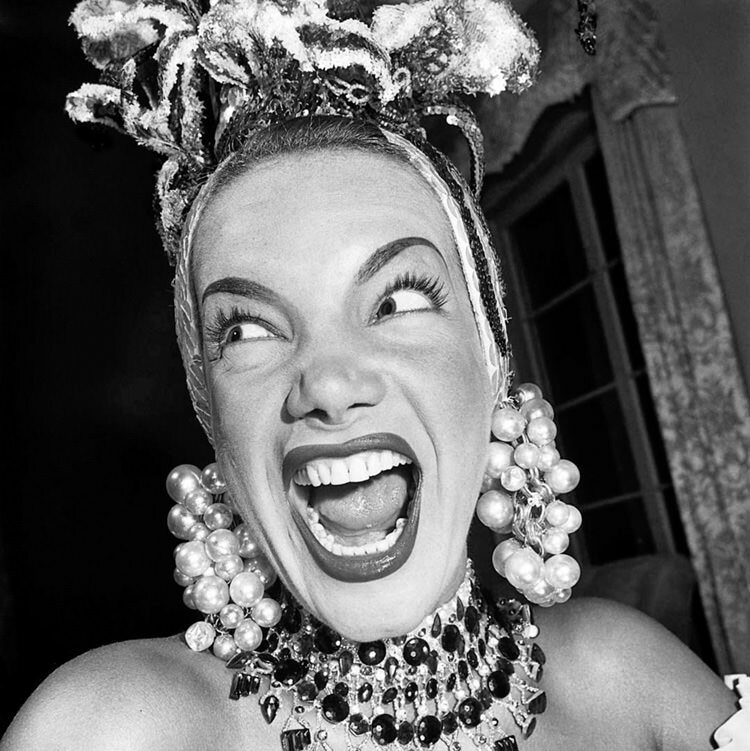 At four the next morning, Carmen Miranda suffered a fatal heart attack. 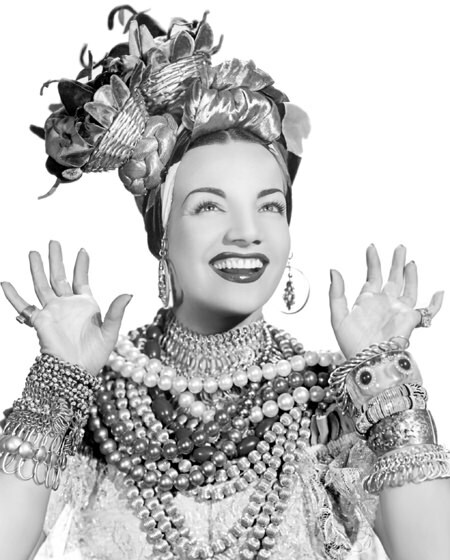 Although Carmen Miranda has been criticized for blurring the cultural distinctions between Brazil, Portugal, Argentina and Mexico, her iconic image has also helped to bring Latin culture into the North American mainstream. The enormous fruit-laden hats (which were made ridiculously high through movie special effects) continue to be an influence in fashion. The Star on the Hollywood Walk of Fame which honors Carmen Miranda's contributions to Motion Pictures lies at 6262 Hollywood Blvd. See also: Tales of Mexico, Fernando Lamas, Lupe Velez, Tito Guizar, and Xavier Cugat. Be the first to comment on "Carmen Miranda"